Good post, just wanted to comment on this, though...Owens in no way, shape or form got the Eagles to the Super Bowl. 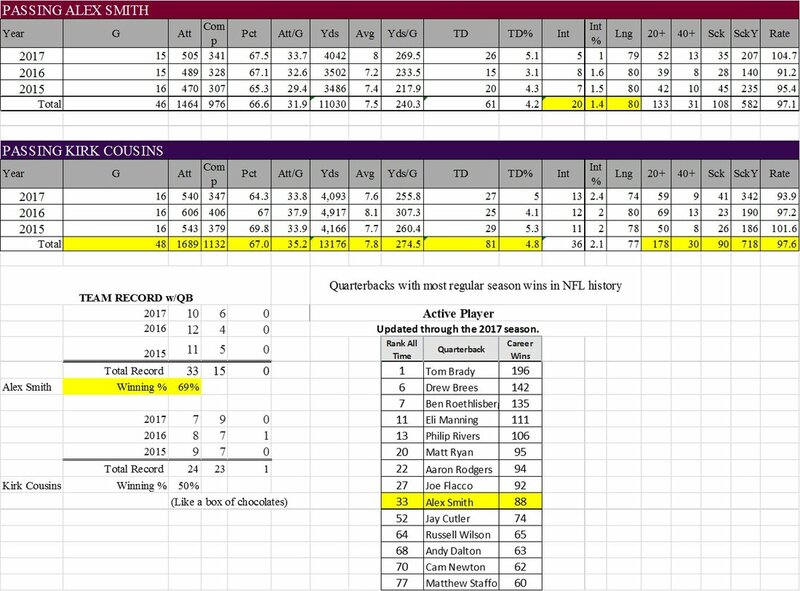 As someone who is VERY excited for Smith, my reservation with last year is how open some of those deep throws were. I know it sounds like a cliche, but he did have a lot of throws into HUGE windows that you don't typically see in the NFL where Hill had his guy beat by 3-4 yards. I don't know enough to say...I've heard he gets pass catchers open, but I don't know how often that results in someone streaking down the field for a 50-yard catch. I will say that Reed being healthy will give Smith a lot of seam opportunities. Jay’s system gets guys open, but they have to have a modicum of route running ability and a bit of burst, speed, or both. IMO, Doctson and Pryor both had issues with rounding their breaking routes and not selling routes well. I could be wrong, but I believe a lot of it comes down to the fact that Jay often runs man and zone breakers on either side of the field. Poor route running allows defenders to stay in, or get back into position. Speaking of which, anyone know anything about Richardson’s route running? A little concerning to me that with his speed, a lot of his plays (as far as I’ve read) came from 50/50 balls and broken plays, as opposed to gaining separation (within a play call). That would be nice, I hope that is the case. I know you think Kirk is a really nice-classy person. I agree with you on that. But Alex is right up there in that same category. He has the reputation of being a super nice guy -- different cat from Kirk -- more of a hip, California, chill version of nice. He does a ton for charity, doesn't say a bad word about anyone, very likable -- that's his rep. Losing Kirk hurt but his contract would have hurt this team more. There’s no debate the situation was boggled from jump street. But the FO responded well to a mistake and didn’t cost the team 28M in cap room this year by signing him. Smith is a good football player and capable of running Gruden’s offense very similarly to Kirk, except his legs will help him out of some tough spots. Gonna be fun to see how he does. I don't think we'll see a dropoff in QB play. Alex is older, but he gives you everything Kirk did, along with better mobility, better off-schedule playmaking, and overall better accuracy. I always thought Kirk was just a younger Alex Smith, since they both have similar skill sets. Smith will do fine here, I think. Not really one to believe so much in curses as I do general ineptitude creating situations that make one appear cursed, but man have I read these kind of statements over the years for damn near every position and for whatever reason - there's almost always a dropoff of some type. I cant be the only one who remembers Alex Smth going an entire year with out throwing a TD to a receiver. Nope. Had to be embarrassing. Here’s hoping that’s well in the rearview. Andy Reid prefers to use RB's and TE's. Going back to his Eagles coaching days T.O, D-Jax, and Tyreek Hill are the recent few (WR's) to have 1000+ receiving yards under his head coaching. Dwayne Bowe had a decent season in 2014 but no touchdowns. The Chiefs did not have any legit options outside of Bowe that season. The way Redskins fans would have saw it they had a team full of Ryan Grants on offense that season. The Chiefs passing offense was terrible that year. Averaged around 200yrs/game but they had a good special teams / defense. I did not see any articles blame Alex Smith for that poor offensive season although I'm he was to blame for some of the suckage. AJ Feeley never thrived for Reid, either. Kolb did just as well for the Cardinals as he did for the Eagles under Reid--which is, mediocre. Neither QB got better on their new teams but neither regressed as well. McNabb slumped hard after leaving the Eagles. Then again, he also wasn't coming off his best season when he was traded...far from it, in fact. I do expect a learning curve as Alex gets used to Jay's playcalling and how our receivers operate, but I think he's been in the league long enough and worked with so many receivers that it will be short. Heck, it took three games last year for Kirk to get up to speed and he'd been with the team how long? The goal for the Redskins is to blend what Gruden has done with what Smith has done and is comfortable with. O’Connell, who is actually younger than Smith, might have the most varied experience of them all. He worked under Kelly, and was key to Washington’s implementation of RPOs (run-pass options) last season. He’s also worked in New England with Tom Brady and Bill Belichick as Brady’s backup as well as a few other NFL backup stops. That ^ looks like a good addition. Might not work out, but that’s a smart move by Gruden, IMO. did not upgrade. Accept for one glaring difference. Freaking wins!!! team, blame the coaches, blame Bruce.......but you have to blame Kirk somewhere in the equation. Particularly when you know that a lot of those passing stats came in the closing moments of a loss. And the interceptions came in the closing or a crucial moment in a game. Thats Joe Gibbish ain't it?